Tree Spade is a tool which is used to transplant trees (uprooting a tree from one location and planting it at a different location). Transplantation is an effective method of saving the trees from being cut which come in the way of important infrastructure, construction, mining, road and oil/ gas pipeline sites. 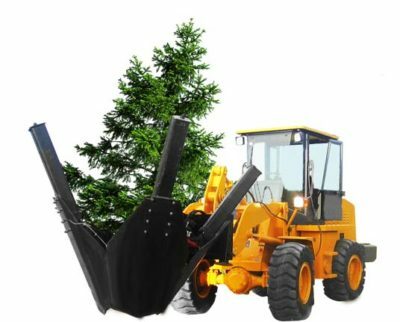 The Spade is mounted as an attachment on a carrier equipment such as a wheel loader or skid steer loader and is operated hydraulically. Spades are employed to cut a hole in the ground at the location where the tree is to be transplanted. Same spades uproot the tree along with the roots and surrounding soil. The tree is then replanted in the previously dug hole. Compact design for ease pf operation in confined areas to avoid damage of close vicinity trees. Enhanced visibility for faster operation/ production. Spades are made of high tensile steel that hardens with usage, for reliable digging and compacting performance. Creates more variety of root ball sizes. Ability to dig both shallow and deep rooted trees. Option of 3 and 4 blades with angles from 25 to 30 degrees. Overlapping blades to ensure clean root cutting.